It has become such a cliché that the civics class rendition of how a bill becomes law bears only superficial resemblance to real legislative practice that even Saturday Night Live is in on the joke (after you’ve watched that clip, see our executive orders chart). The lawmaking process does not end with the president’s signature, contrary to the tidy story presented in civics books. Instead, the passage of the law might well be considered the foundation, not the end of lawmaking. The Federal Food, Drug, and Cosmetic Act (FDCA) vividly demonstrates the point. The FDCA, which President Franklin Roosevelt signed into law in 1938, revamped the legal authority for the Food and Drug Administration (FDA). 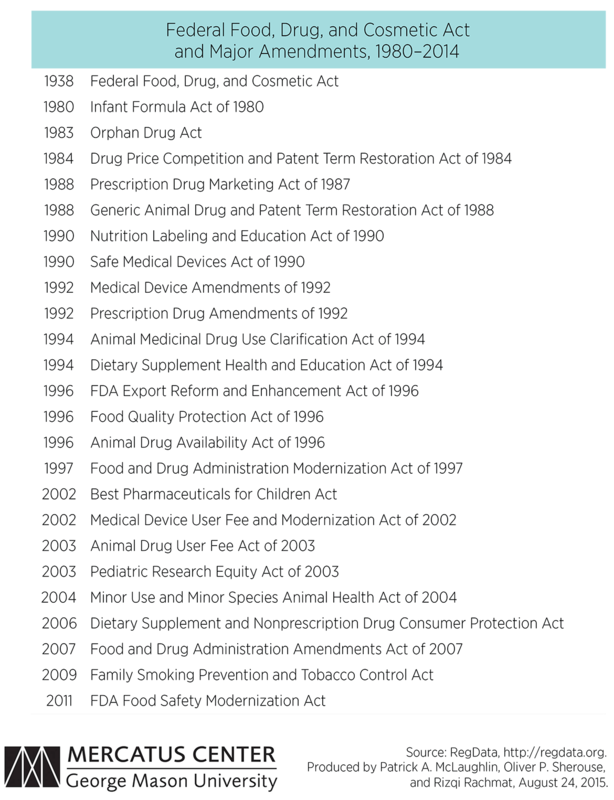 In the nearly 80 years since, the FDA has built on the foundation of the FDCA and its amendments a tower of regulations, each of which has the force of law. With RegData, we can size up this accumulation of regulatory law. RegData counts the number of words and individual regulatory restrictions—words and phrases that identify a specific mandatory or prohibited activity—in each part-level division of the Code of Federal Regulations (CFR). Each CFR part is matched with the agency and department that created it. Agencies must state their statutory authority for each regulation they issue, and so RegData also associates words and restrictions with the acts of Congress that modified that authority. Taken together, these data shine a light on the regulatory growth from laws such as the FDCA. The FDCA itself was 19 pages long and contained about 11,700 words, as printed in the United States Statues at Large. In the 2014 edition of the CFR, the regulations associated with the FDCA comprised about 2,180,000 words. About 130,000 new words were added in the previous ten years. One notable feature of the graph is the decline in restrictions starting in 1996 through 1999. That period, which included the passage of the FDA Modernization Act of 1997, saw a 12 percent decrease in restrictions. Equally notable, however, is the speed with which that trend was reversed. The restriction count has grown steadily since 2000, and in 2010 it surpassed the previous high. The lesson for lawmakers—and the public—is clear: regulatory legislation is not a single event. New laws tend to empower agencies indefinitely, and courts tend to defer to agencies’ interpretation of regulatory legislation. For nearly 80 years, the FDCA, the original statutory authority, and its amendments have formed the foundation of the tower of regulations built by the FDA, and they are used to add regulations to the top. Statutory authorizations of regulatory actions, like the FDCA, effectively act as one-way ratchets in the long term—they instigate and support the accumulation of regulations over time. There is no counterbalancing mechanism, such as an agency or commission, charged with reviewing, modifying, or eliminating older regulations that exhibit obsolescence, duplication, or ineffectiveness. Congress would do well to consider not only how a new law is conceived of today, but also what it may become in the years and decades to come.